Former president Theodore Roosevelt died at his family home, Sagamore Hill, near Oyster Bay, New York 100 years ago today, on 06-January-1919. He was only 60 years old. Vice President Thomas R Marshall said "Death had to take him in his sleep, for if he was awake there'd have been a fight." 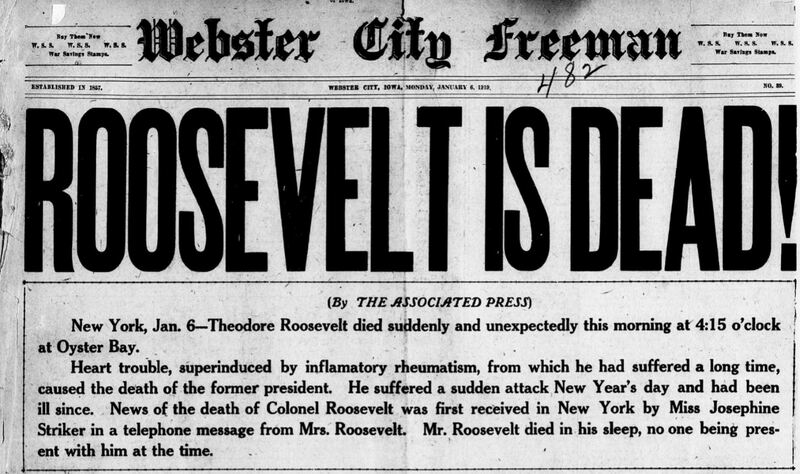 New York, Jan 6 -- Theodore Roosevelt died suddenly and unexpectedly this morning at 4:15 o'clock at Oyster Bay. Heart trouble, superinduced by inflammatory rheumatism, from which he had suffered a long time, caused the death of the former president. He suffered a sudden attack New Year's day and had been ill since. News of the death of Colonel Roosevelt was first received in New York by Miss Josephine Striker in a telephone message from Mrs. Roosevelt. Mr. Roosevelt died in this sleep, no one being present with him at the time. Oyster Bay, N. Y., Jan. 6. -— Colonel Theodore Roosevelt died in his sleep early today at his home on Sagamore Hill. The colonel suffered a serious attack of rheumatism and sciatica on New Year's day, but none believed his illness likely to prove fatal. The former president sat up most of Sunday and retired late last night. At about 4 o'clock, Mrs. Roosevelt, who was the only member of the Roosevelt family at home, went to his room and found him dead. Pulmonary embolism -— enlargement of the lung from a clot of blood -— was the cause of death. Mrs. Roosevelt sent a telegram to Colonel Ender, cousin of the former president, and he came to the Roosevelt home immediately. Telegrams were immediately dispatched to the colonel's children in other parts of the country. Two sons -— Major Theodore Roosevelt, Jr., and Captain Kermit Roosevelt —- are in service abroad. Captain Archie Roosevelt and wife left New York last night for Boston, where his wife's father is seriously ill. Mrs. Ethel Derby is in Akin, South Carolina. Telegrams of condolence and even pithy have been pouring in from all parts of the country today, as news of the death of the former president became known. The former president came home to Sagamore Hill from Roosevelt hospital Christmas day, but a week later suffered an attack of rheumatism and sciatica, affecting his right hand. Three physicians attended the ex-president at Roosevelt hospital when he was taken there seven weeks ago. They were: J. A. Faller, Oyster Bay, and J. H. Richard and John H. Hartwell of New York. Washington, D. C-, Jan. 6. -— Flags were lowered to half mast at the White House, the capital and on all public buildings upon the announcement this morning of the death of Colonel Theodore Roosevelt. Secretary Daniels and General March ordered flags to fly at half-mast on every ship on shore duty and at army posts and camps at home and abroad. The death of Colonel Roosevelt as a shock to all citizens. Regretat the passing of a great figure was heard on every hand. Profound sorrow is felt by many who knew him personally and political friends and those antagonistic to him joined in expressions of regret. Workmen on a new building here were quickly heard to be discussing his death. Oyster Bay, N, Y., Jan. 6. -— The time of the death of Colonel Roosevelt was about 4:15. A minute «r two before, Sam Amos, young colored man, who has been the former president's attendant since he left the White House, noticed that he was breathing heavily and went to summon Mrs. Roosevelt, but when he returned with her, he was dead. New York, Jan. 6. — Colonel Roosevelt suffered an attack of pulmonary embolism, which nearly cost him his life three weeks before in Roosevelt hospital, which he left for his home on Christmas day. the day before Christmas, before leaving the hospital here, he felt fine. Miss Josephine Striker, his private secretary, said that Mr. Roosevelt suffered a slight pain intermittently, but that his illness was far from serious. So much improved was his condition that Mrs. Roosevelt, who at the beginning remained with her husband, was implored by him to rest. She went to their home at Sagamore Hill, returning several times a week, bringing him table delicacies. Two separate blood/ tests confirmed the decision that the Colonel was free from any organic disease. His only trouble was rheumatism. This primarily affected his left leg but at times affected his hand and arm. On the Sunday previous to his departure for home he dictated articles for the Kansas City Star and other papers. He ate well and slept like a child. His last illness was in February, when he was taken from Oyster Bay to Roosevelt hospital when he suffered an operation on his ear. Theodore Roosevelt, aged 60, the 26th president of the United States, was born in New York City Oct. 27, 1858, his ancestors being Dutch on the paternal side and Scotch-Irish on the maternal side. He graduated from Harvard university in 1880. From 1882 to 1884 he was a member of the legislature of his state and gained wide reputation because of his work for reforms. In 1884, at the age of 26 years, he was chairman of the New York republican delegation to the national convention and two years later was the republican candidate for mayor of New York City. In 1880 he was appointed by President Harrison as a member of the national civil service commission and served as president of the board until 1895, when he resigned to accept the presidency of the board of police commissioners of New York, a position he filled with great credit to himself, proving a terror to lawbreakers. In 1807 he was made assistant secretary of the navy by President McKinley, but on the breaking out of the Spanish American war in 1898 he resigned and organized the First United States volunteer regiment of cavalry, popularly known as the Rough Riders, of which he was lieutenant colonel. He won distinction at the battle of San Juan Hill and was promoted to the rank of colonel for conspicuous bravery in action. In 1808, after the close of the war, he was nominated and elected governor of New York. At the republican national convention In 1900 he was nominated for vice president on the ticket with William McKinley and at the death of McKinley in 1901, he succeeded to the presidency. He was nominated for president by the republicans in 1904 and was elected by the largest majority ever accorded a presidential candidate. At he conclusion of his term as president he retired as the most popular man since Lincoln, because of the fine record he had made. In 1912 he was again a candidate for president but was defeated in the national convention. Soon afterward he organized the progressive party and was Its candidate for president in 1912. He was defeated by President Wilson. Since then he has taken active part in political discussions and at his death was probably the most influential private citizen In the United States.